There’s nothing like a Christmas tree to give your home some holiday cheer. If you’re looking to celebrate Christmas on a tight budget, there’s no need to skip this winter essential. With the right deal-hunting know-how, you can easily snag a stunning but inexpensive Christmas tree, whether it’s an artificial fir or a real tree you’re looking for. An artificial tree usually has a higher upfront payment, but it can save you money over the long term, since you don’t have to buy a new tree every year. And for consumers who don’t want to deal with the mess of dry needles that real trees leave, an artificial tree can be a particularly practical choice. If you’re considering going artificial this year, first check out your used options before hitting the stores. Artificial trees are often up for sale on Craigslist, where you’ll find the tree’s previous owners listing it for less than you’d find elsewhere. While you should expect to pay at least $100 on a decent artificial tree purchased new, you can get a used tree in good condition on Craigslist for as low as $20 or less. You’ll also often find decorations thrown in for free, or listed separately for sale or trade. If you’d rather buy new, check out Amazon for discounted items available with free shipping. You may also find coupon codes or sales at Treetopia.com, BigLots.com, HayNeedle.com, ChristmasCentral.com and ChristmasLightsEtc.com. Some of these sites have extended Cyber Monday sales running through the first week of December. You can also check out the artificial selections offered online at Target, Home Depot and Wayfair. To save you even more money, consider choosing a tree that comes with the lights already on it, which is more cost-efficient than purchasing lights separately. You may also find deals on trees in unique colors, such as white antique trees. 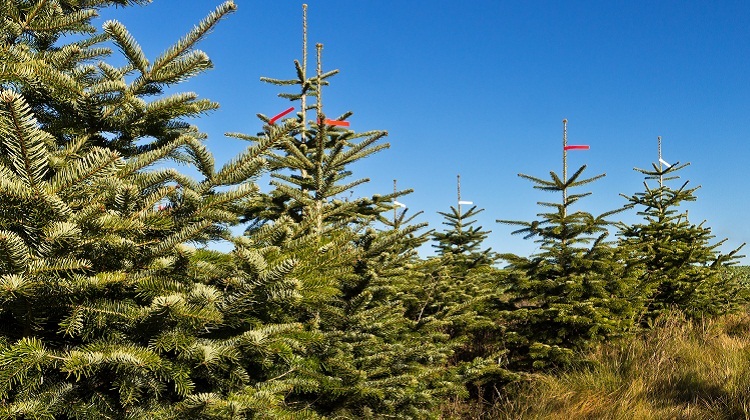 If you live near a forested area, consider cutting your own Christmas tree this year. Not only is it a great way to save money, you can also make an adventure out of it as you and your family explore the woods to find the perfect tree. Check the USDA’s Forest Service website to see if there are any Christmas tree cutting areas near you. With the purchase of a permit for anywhere from $4 to $15, you’ll legally be allowed to cut your own before Dec. 25. Depending on where you live, you may also be required to pay an additional fee for the tree itself. If you’re interested, don’t wait, since permits may run out as Christmas approaches. Shoppers who prefer trees already cut or potted may be able to get a deal by shopping wholesale. Wholesale retailers often sell directly to customers as well as retail lots, saving you a pretty penny by cutting out the middleman. If neither of these options is available to you, use the National Christmas Tree Association’s locator tool to identify the Christmas tree sellers in your area. By shopping around and comparing prices, you can make sure you get the best deal on your tree. And don’t forget to haggle. Since tree-lot operators are often willing to negotiate, see if you can bring down the price – 50% off is a good place to start bargaining. Major retailers like Walmart and Home Depot may offer some of the lowest prices, but beware low-quality trees. Avoid brittle trees, instead going for those with branches that are soft to the touch. To get an idea of what condition a tree is in, give it a little shake to see how many needles it sheds. You may be more likely to find a quality, long-lasting tree at a local farm – which may also be a more sustainable option. The type of tree you choose will also affect its price. You’ll pay more the taller – and wider – a tree gets, so opt for a small or slim tree to save money. Less popular species of trees may be priced less, making them a great choice if you’re not picky about what kind of tree you’d like. Avoid expensive trees such as the Fraser fir, the Appalachian native species voted most popular in the United States. Noble firs generally cost more than Douglas firs, but you’ll save even more if you skips firs altogether and opt for a pine tree. If you choose a live, potted tree rather than a fresh-cut one, you’ll pay more upfront but have the opportunity to use your tree again next year, particularly with small varieties that can be easily transported in a pot. If you’d like to give your tree a permanent home in your backyard, choose a Norway spruce, one of species most likely to survive replanting. Finally, one of the most reliable ways to secure a discount is to wait. The closer you get to Christmas, the cheaper you’ll find a tree, but you’ll have to make do with a much more limited selection. If you wait until Christmas Eve or Christmas Day, you’ll find the biggest bargains on trees – as long as you don’t mind spending most of December without a tree.